Kale is here to stay. A “wild” member of the cabbage family, this rough green can be cooked or made into salads such as the classic Caesar Salad created by August Escoffier for his friend Caesar Ritz. Kale is high in fiber (which helps digestion), full of phytonutrients which help detoxify our bodies and has a wide array of vitamins and minerals that are beneficial for the whole family. Make sure you “massage” the dressing on to the Kale so it really absorbs the flavor of the dressing. Serve it with grilled Portobellos, tofu or add it to a wrap for a twist! 1 each anchovy fillets minced *optional! Wash and cut Kale in small bite size pieces and set aside. Mix garlic, anchovies, Dijon, Tamari, lemon juice and grated Parmesan with mayo. Slowly whisk in olive oil to mix to make your dressing. 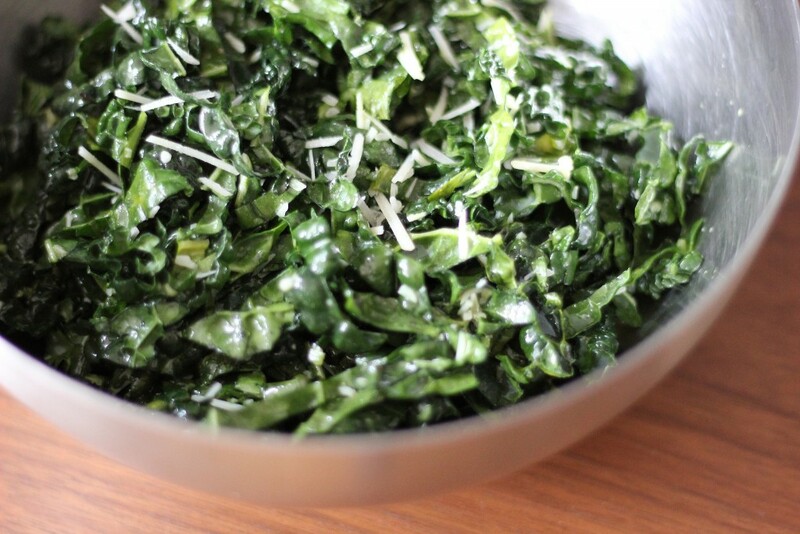 Toss Kale with dressing, top with shaved Parmesan cheese.